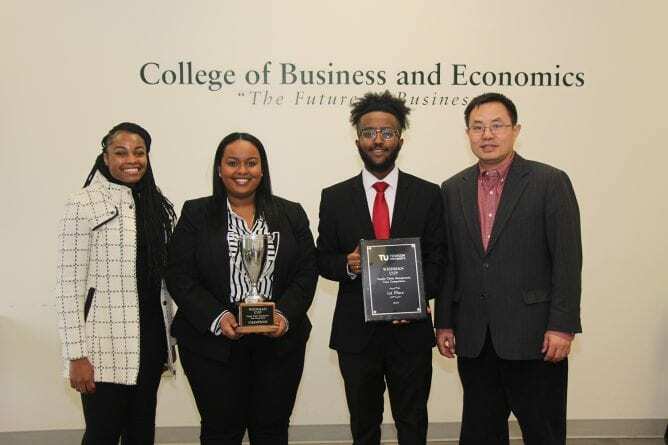 Towson University won first place in the fifth annual Weinman Cup Supply Chain Management Case Competition in early March. Yeabsira Mezgebe and Beza Wondimu, both juniors studying project management and business analysis who were mentored by their professor Chaodong Han, Ph.D., took first place. Teams from Stevenson University and Morgan State University took second and third place, respectively. Organized by Towson University’s Master of Science in Supply Chain Management program and sponsored by the Toby and Melvin Weinman Foundation, the competition brings students from across the region to Towson University each year to develop solutions to real-world challenges and compete by presenting to a panel of industry judges. Penguin Random House sponsored this year’s case, which dealt with issues publishers are facing due to a growing demand for printed books and a decreased book manufacturing capacity. Working under faculty mentors, teams proposed solutions to alleviate the symptoms of this imbalance. Launch in 2015, the competition takes place each spring and is open to undergraduate students from around the region.